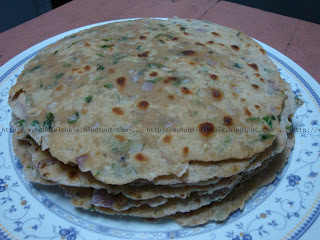 These parathas are another one of my favorite savory breakfast items. Like the Aloo Parathas, it can be served with some unflavored yogurt or pickle. But I like it served pipping hot with a dollop of butter and a mug of good hot coffee. To me that sums up a great breakfast. The parathas are easy to make because there is no stuffing involved, all the ingredients are mixed together to form a dough. They can be made the previous night and kept in refrigerated in a covered container. All you need to do the next morning while the coffee is brewing, is warm it on a tava (griddle) and you're all set. Usually fenugreek is known to have a bitter-ish taste. These parathas however aren't. For this recipe, I don't use the baby fenugreek leaves but the larger ones. Another thing to keep in mind, is that when you are cleaning the sprigs of fenugreek leaves, make sure you pick only the leaves and not the stalk, no matter how tender you may find the stalk to be. You might want to allow a couple of extra parathas per person as these are not as heavy as the Aloo Parathas are and they are very more-ish. I added a couple of hot green chillies. You can either deseed them to cut down the heat or simply cut down the amount of chillies if you are not used to spice. Also, if you are calorie conscious, you can leave out the ghee and these parathas will still be tasty. In a large bowl, mix all the ingredients well to make sure they are well distributed. Make a well in the centre and gradually add enough water to bind into a pliable dough. Divide into portions the size of a golf ball and keep ready. Roll this out to a thin disc on a floured surface. Place this on a well heated tawa / griddle and roast for a while moving it around till light brown spots appear on one side. Turn over and cook on the other side till light brown spots appear on the other side as well. To finish off, spoon a few drops of clarified butter on the paratha and spread. Flip over and repeat this on the other side letting it roast for a few seconds after you add the clarified butter to the side. Serve hot with butter and a mug of hot coffee. You can leave out the clarified butter if you want an even healthier version, but it does wonders for the taste. That plate of parathas look delicious. In singapore, where i grew up, these are knowns as "pratas" and they are usually served with curry or just plain sugar! When I make them plain, I love eating them with a little butter and a sprinkling of sugar. Thanks for stopping by! wonderful and delicious parathas !! What an interesting looking recipe. These look wonderful! Thank you everyone for stopping by and for your kind words!!! These breads sound so flavorful. I have never eaten fenugreek leaves, so I found this post really interesting. Thank you for sharing a wonderful recipe with Let's Do Brunch. The linky is up again for this week and we would love it if you would come along and join in. I hope you get a chance to try them out soon, I love them. Thanks for stopping by. Thanks Rachel, I hope you enjoy them as much as we do!